Way back in June 2008, when I took the above photo, the first cracks in the economic meltdown were starting to appear. Projects already in progress - Encore, City Center, Cosmopolitan, Echelon, and Fontainebleau - were blasting skyward, promising a new reality for the Las Vegas Strip. 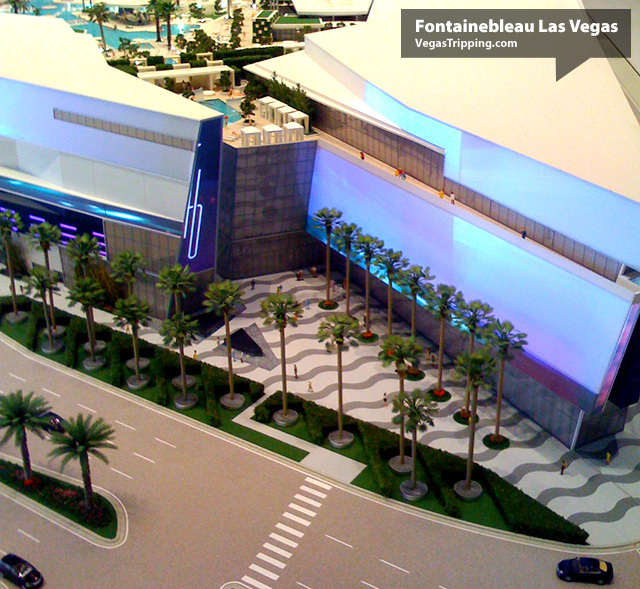 At about the same time, we published a Timeline of Future Las Vegas Casinos 2008-14. So rocky were the times, we updated it two more times within a year... even adding a trash can to the nifty graphic. I don't know about you, but I'm eagerly awaiting the opening of Viva Station, the Las Vegas Plaza and the fourth Venetian hotel tower later this year. It is easy to forget a project when all that remains is a rendering and a press release. Fontainebleau on the other hand is a daily reminder of dreams dying on the vine like a late summer tomato in the punishing desert heat. In recent years, we've heard news of suitors expressing interest. Steve Wynn looked at it and decided against. At least two other independent Strip operators have also taken serious peeks, one of which came very close to quietly buttoning up a very close to the vest purchase. Fickle tickles aside, time ensures that Fontainebleau will eventually be finished... either as a functioning resort or steel and glass headed straight to the homeless smelter. Picking through the dried shards of weather worn cheddar, we learn of the Fontainebleau's nightclub that never was, located in the very spot pictured above. Our take off point was the concept that "LAS VEGAS IS FETISHIZED REALITY." With this in mind, we set out to conceive a series of spaces designed to incorporate and actualize a sequence of fetish themes. Voyeurism, exhibitionism, dominance and submission were all weaved into the spaces, taking advantage of cutting edge materials and audio/visual technologies. It sounds very apropos to Fontainebleau to use "fetishized reality" as a conceptual departure, the entire project was couched in gobs of unintentionally comical artspeak - from promo reels to the handful of advertisements produced in advance of the project being put on hold. I'm certainly attracted to the 'deck of the Enterprise' rounded curves and sloping angles of the booths, but it seems like it might be a little bit to small to generate the orgiastic critical mass the newest waves of ginormous dance floors do. The club is located adjacent to pool deck, lending itself perfectly to the daylife/nightlife phenomenon although it doesn't appear to open up naturally. I suspect the walls separating the club from the pool would've been taken down immediately. What is surprising with the layout is that the club doesn't take advantage of The Strip facing perch. Then again, I doubt you'll find many a party goer who will be psyched exuberantly raise a schooner of overpriced champagne at the Circus Circus marquee. Maybe there was one, once. Another interesting feature of the club is the birth canal entry tunnel. Why do nightclubs do this? Seems like a waste of square footage, put the line outside! Welcome To The Nightclub That Will Never Be. Big huge thanks to VT superduper incredible mega-ferret Mac78130 for yet another fascinating tip. He's chewing through the other side of the underweb! I take pictures of the caecass of the FB every time I am in Vegas. If it had opened it may have done well but we will never know.